The Central Ohio Housing Report for January 2012 was released today, January 2012 central Ohio housing sales were up. Central Ohio Housing Sales are Up! The Central Ohio Housing Report – January 2012 is about closed sales. The market reports I did with information from Trendgraphix were primarily for single family residential real estate with an occasional condominium market report. The Columbus Board of REALTORS® (CBR) reports are “residential” a combination of single family and condominium. The information you will see quoted in the Columbus Dispatch is for the entire Columbus Board of REALTORS® mls (multiple listing service.) The Columbus Board of REALTORS® mls is all of Franklin, Delaware, Fayette, Licking, Madison, Morrow, Pickaway and Union Counties as well as parts of Athens, Champaign, Clark, Clinton, Fairfield, Hocking, Knox, Logan, Marion, Muskingum, Perry and Ross Counties. Personally I focus on northern Franklin County and southern Delaware County, so other than repeating what the Columbus Board of REALTORS® … who is “THE VOICE FOR REAL ESTATE IN CENTRAL OHIO.” Our new president…for 2012, Jim Coridan is I believe a commercial real estate broker. Press releases will quote Coridan as the President of the Columbus Board of REALTORS® for the next 11 months as well in the press releases with the official word on the local real estate market. * I am a member of the Columbus Board of REALTORS®, the Ohio Association of REALTORS® and the National Association of REALTORS® (known as NAR) along with almost all real estate licensees in central Ohio. 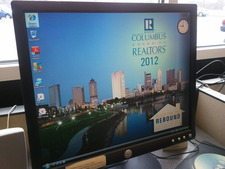 The image is a computer monitor at the Columbus Board of REALTORS® the screen saver promises a rebound in 2012.